Wildfires: Fight, Flight, or Coexistence? 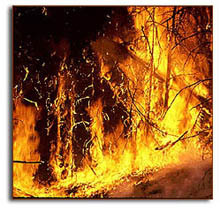 has students examine the history of wildland fires and their impact on society in America. Exploring our approaches to living with fire, students will examine various fire management techniques including prescribed fires, fire suppression, and fire prevention. Students will take a closer look at the Tillamook burn in Oregon, and conduct a research project on wildfire history in another state. Students will also gain a better understanding of Smokey Bear and the role of symbols in information campaigns. Image Caption: A wildfire in Yellowstone Park. Courtesy of NOAA Paleoclimatology Program. The students will conduct historical research; obtaining historical data. The students will identify historical issues, evaluate alternative courses of action and formulate a position or course of action on an issue. The students will learn how the rise of heavy industry and farming transformed the American people and land. The students will examine the ways in which institutions change over time, promote social conformity, and influence culture. They should be encouraged to use this understanding to suggest ways to work through institutional change for the common good. Download and Print: Module 9 Teacher & Student PDFs using Adobe Acrobat and make one copy per student of the student pages. For Day 1 activity: Read over the teacher's directions for Worksheet 1, then using index cards recreate worksheet 1. Each index card should have the question from the left column of worksheet 1 on one side and the corresponding right column (answer) on the other side. Be sure to read the directions to understand how this activity works before using it with students. What do you know about wildland fires? Do you think wildfires are a problem? Have you ever seen an area that has experienced a wildfire? What do you think we should do about wildfires? What is a prescribed fire? Now read the essay, “Wildfires: A History of the Blaze” together as a class (silently at desk or out loud). Then do the Reading Comprehension Activity (teacher's directions), worksheet 1. Assign Worksheet 2. Read: The Tillamook story, "An Oregon Legend: From Ashes to Forest." Assign: Worksheet 3 Teacher Instructions: Create a State Fire poster to relay wildfire information on your state and present it to the class later in the week. Hand out and discuss Worksheet 3, Rubric 1, and Rubric 2. Watch: Smokey Bear segments of The Greatest Good: a Forest Service Centennial Film. To obtain a copy of the film order here. Assign: Worksheet 4: Create a New Character to be used in a Public Service Announcement promoting the necessity of fire for a healthy forest ecosystem. Hand out and discuss Rubric 3. Application and Integration Exercise has been designed to allow students to integrate the content into broader contexts. The Test has been designed to measure how well students master the History objectives. The Reflective Exercise has been designed to measure how well students master the Social Studies objectives. Arrange a field trip to a local forest and examine a burn site or arrange a field trip to get a first hand look at fire fighting tools and equipment. Or invite a guest speaker from a local forest to discuss their firefighting tools, equipment and management plan in more detail. Have students conduct further research on smokejumpers and create a video, or write a newspaper article about the history of smokejumping. Student can learn more about the first smokejumping teams, first female smokejumpers, first African American smokejumpers, changes in smokejumper techniques, uniforms,etc. Basically allow students to find any new information that was not included in the Essay. Technology: Students could conduct Internet research in their technology class. Students could also create some type of graph (using Excel) or graphic for their State Fire Poster in Worksheet 3. Students could also create a PowerPoint presentation to use when presenting Worksheet 3. English: Students could give their speeches from Worksheet 3, Rubric 2 in English class. Math: Using the Wildfire Timeline have students graph the occurrences of major wildfires and the number of acres burned. Science: Have students learn more about forest succession and research the ecological benefits of wildfires in the forest ecosystem. Goudsblom, Johan. Fire and Civilization. London, England; New York, New York: Penguin Books, 1992. Forest History Society Bibliographic resources on wildfires and environmental history. Ordering Resource for: American Forests: A History of Resiliency and Recovery, The Greatest Good Film. e-11th Hour Wildland Fires background and fact sheet. Information provided by the Federal Emergency Management Agency (FEMA) and the Bureau of Land Management (BLM). Oregon Department of Forestry Information on the Tillamook burn and the Oregon Department of Forestry. USDA Forest Service Living with Fire Game for ages 10 & up. This site contains some valuable information about forest fires, even if you do not have students play the game. It is designed for Science teachers.